OWP’s tasting panel faced the challenge of evaluating a range of types and styles at a single sitting. Sparkling and dessert wine categories encompass a lot of territory, from bone dry to intensely sweet, and from the lightest and brightest of whites to the most impenetrably pigmented of reds. 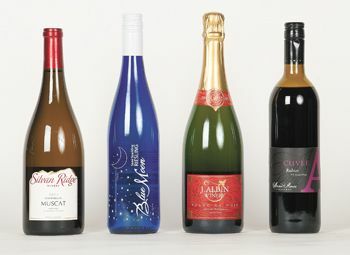 There are nine possible combinations — dry, semi-sweet, sweet, and slightly, semi- and fully sparkling — in the sparkling wine category alone; not to mention the different varieties and blends. 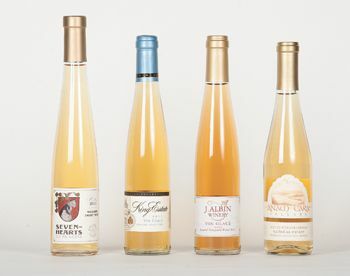 Dessert wines employ many varieties of grapes, along with other fruits and berries as well. They can also vary considerably in the amount of residual sugar retained after fermentation. Then there is the fortified wine category. Add them all together, and there is the opportunity to have a broad spectrum of types submitted for evaluation at this kind of tasting. When a sparkling wine is made “méthode Champenoise,” the customer knows, at the very least, an effort has been made to create a product that possesses the special character of finely dispersed, long-lasting effervescence and the distinctive, yeasty flavors that can be achieved only in this manner. Put succinctly, this wine has succeeded in doing just that. The most famous of Bridgeview’s notable blue bottle wines is their Riesling. This semi-sparkling version adds a different dimension to the longtime value favorite. Gentle, tingling sparkle the Italians call “frizzante,” along with an irresistible rose aroma, a hint of orange zest and a just off dry crispness encourages continued consumption. The floral, citrus and musk aromas of Muscat appeal to almost anyone with a sweet tooth, and this one doesn’t disappoint. To top it off, it’s an American rendition of Italy’s favorite sparkler, Asti Spumante. Golden Delicious apples, grapefruit and stone fruit play off fresh effervescence and bright acidity. 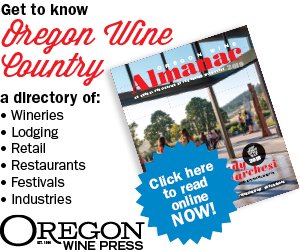 The grapes are 56 percent from Washington and 44 from Oregon, arguing for a Northwest wine category. This big boy is deep and dark with piquant hints of charcoal smoke on the nose. A medley of intense flavors follows, led by dried figs wrapped in leather, covered with ripe plums and dipped in dark chocolate. The luscious liquid spent 27 months in French oak barrels, taking on a smooth, mouth-filling mellowness that lingers long. Although the label gives no indication, the steeply sloped, 375-milliliter bottle and honey-gold hue impart serious late harvest signals. At 21.8 percent residual sugar and 8.3 percent alcohol, it is made from grapes grown on just one acre of the winery’s estate vineyard. The spicy, varietal aroma introduces a clean, bright palate featuring pear, cinnamon and honey. A multi-dimensional wine that says dessert without overdoing it. Who but Oregon’s largest Pinot Gris producer, not to mention its largest winery, would do any better with late harvest Pinot Gris? Grapes frozen at 36.6 brix yielded 17.5 percent residual sugar and another succulently sweet charmer made by the stately Lorane winery. Not much but a lot is one way to describe a very appealing wine of which only 77 cases were made. The winery contracts for small selected lots each vintage. This batch of late harvest Viognier from the Columbia Valley yielded a whopping 24.7 percent residual sugar, which plays off hints of fig, tropical fruit and grassy herbaceousness. A fresh, clean profile brings it all into balance. The term vin glace, French for “ice wine,” is not a wine category in France; however, it does convey a certain cachet, compelling more than one winery here to adopt it for their frozen, late harvest efforts. Weighing in at 18.2 percent residual sugar, this example exhibits flavors of Honey Crisp apple and orange zest on a finely tuned framework. A smooth, long finish completes the ambrosial experience.